Type is my candy | Type for you. Atelier Carvalho Bernau’s is launching a new workshop to be held at FBAUL in March 2007, Lisbon – Portugal. During 4 days, students or professionals will have the task to draw typefaces inspired on Portuguese vintage and vernacular packaging lettering. 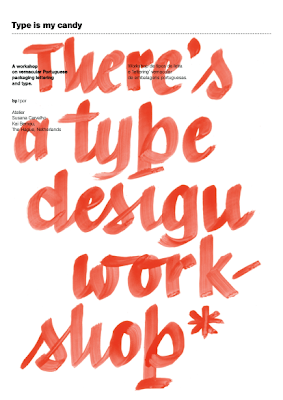 You can follow the progress of the workshop and others news at Typography needs you! Weblog. Atelier Carvalho Bernau is also responsable for the series Type the City!